You are here: Home » MEDIA » Books » The Fortress In Orion by Mike Resnick (book review). The Fortress In Orion by Mike Resnick (book review). Colonel Nathan Pretorius only just survived his last mission. Actually, if you take into account the couple of times he died during surgery, technically he didn’t, but the Democracy doctors have put him back together – prosthetic foot, cloned kidney and spleen and all. Now they want him to lead another mission. Seeing as he is the only surviving member of his last team, Pretorius wants to choose his own people this time. Rejecting military candidates, Pretorius vets his contacts for less conventional candidates. 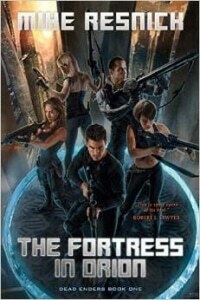 The team he puts together resembles a carnival side show and is a large part of the fun of ‘The Fortress In Orion’. Strong man Felix Ortega has been less fortunate than Pretorius when it comes to hanging on to his original body parts. He’s now more machine than human. Sally ‘Snake’ Kowalski is a contortionist and a thief. Pandora has never met a computer she can’t hack. Circe can tell if you’re lying and probably why and Gzychurlyx has a name no one can pronounce. No one knows quite what he is, neither, but he’s an incomparable illusionist! Their mission is to replace Michkag, the leader of the alien Traanskei Coalition, with a clone. Their directive allows them to either kidnap or kill the original Michkag, so long as the clone is left in his place. Raised from a tissue sample, the cloned Michkag will then subvert the Coalition’s objectives, thus bringing an end to the war. The catch – there is always a catch – is that the only place they can attempt the swap is a heavily guarded fortress deep in Coalition territory, the fortress in Orion. Mike Resnick approaches this adventure with exactly the right tone. The mission is impossible and so he puts together a team of implausible characters to take a crack at it. Nathan Pretorius is a likeable hero. His suitability for the mission is quickly obvious. His reticence to actually lay down a plan is a fairly transparent ploy. He’s either brilliant or skidding along on the seat of his pants, probably both. It’s the combination of planning and improvisation that allows the team to navigate the many obstacles in their path, however. It might be unfair of me to say I expected the mission to end differently. The team certainly faced enough challenges along the way. I thought there’d be this unexpected twist, but maybe I’ve been reading too many over-complicated books or maybe the twist is coming later in the series. The novel also lacks strong character development, but Resnick does take the opportunity to showcase each team member, giving each a chance to share what motivates them. I wanted to know more, particularly about our intrepid leader, Nathan Pretorius. I’m also sure there’s more to Gzychurlyx than meets the eye, which is a terrible pun, given his nature. Hopefully we’ll get more up close and personal with the “Dead Enders” in future adventures. Stalking The Zombie by Mike Resnick (book review).